PM Modi and President Moon held constructive talks on enhancing bilateral cooperation in key areas including trade, investment, defence and security. 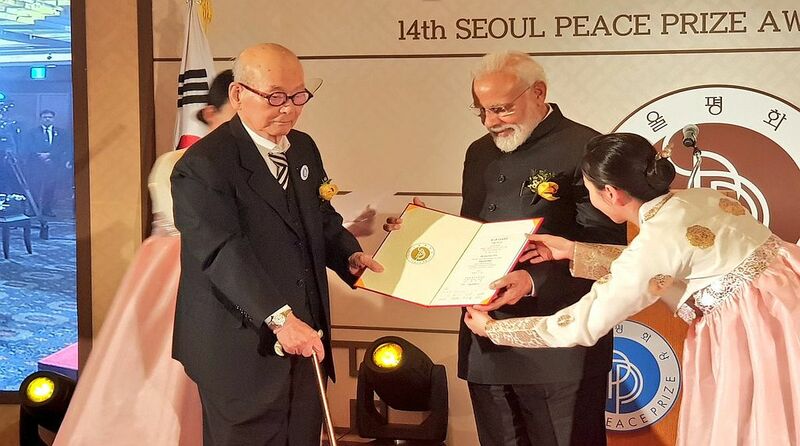 Prime Minister Narendra Modi was on Friday awarded the Seoul Peace Prize in recognition of his efforts aimed at raising global economic growth, accelerating the human development of the people of India and furthering the development of democracy through anti-corruption and social integration efforts. Dedicating the award to the people of India, PM Modi said, “This award does not belong to me personally but to the people of India, the success India has achieved in the last 5 years, powered by the skill of 1.3 billion people”. He further said he was honoured that the award was conferred on him in the year India celebrates the 150th birth anniversary of Mahatma Gandhi. Talking at the 14th Seoul Peace Prize award ceremony, PM Modi said radicalisation and terrorism are the biggest threats to world peace and security in the present time. He further called upon the need to join hands to completely eradicate terrorist networks. “Only by doing so, can we replace hate with harmony,” he said. The Prime Minister also quoted a portion of the 1988 Olympics theme song, which goes as “Hand in hand, we stand, all across the land, we can make this world, a better place in which to live”. PM Modi’s speech comes in the wake of the Pulwama terror attack that killed at least 44 CRPF personnel on February 14. 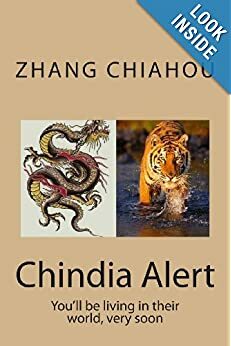 While choosing PM Modi, the award committee had recognised the Indian leader’s contributions to the growth of the Indian and global economies, crediting ‘Modinomics’ for reducing social and economic disparity between the rich and the poor. Earlier in the day, PM Modi met South Korean President Moon Jae-in and expressed his gratitude to the President for his condolences on Pulwama attack and support against terror. Addressing the media after the “productive talks” with President Moon, PM Modi said that South Korea is an important partner in India’s economic transformation. He further said the defence sector was an important part of India’s growing partnership with South Korea. “An example of this is the induction of K-9 Vajra artillery gun in Indian Army,” the PM added. Following the talks, India and South Korea signed seven agreements to enhance cooperation in key areas, including infrastructure development, media, start-ups and combating trans-border and international crime. An important MoU was signed between the Korean National Police Agency and the Ministry of Home Affairs to enhance cooperation between the law enforcement agencies of the two countries and combat trans-border and international crimes. Modi, who is on a two-day visit to South Korea to strengthen India’s strategic ties with the country, was accorded an official reception at the Blue House, the executive office and official residence of the South Korean President here. He also met First lady Kim Jung-sook. PM Modi is visiting South Korea on the invitation of President Moon Jae-in. This is his second visit to the Republic of Korea since 2015 and a second summit meeting with President Moon Jae-in.